I don’t think this episode was intended to be a series finale. This show was officially reported as cancelled with just four episodes to go about a month ago, and it seems to me that the writers might have been planning on having this show go on for a while more even though this historic trip to Cuba was exactly the kind of event fitting for a series finale. It’s great that Marty and Jeannie got married, even if the proposal was hardly romantic. And good for them for realizing that they could screw over both Monica and Skip by leaking false information via the platform they knew already that Monica had hacked, and for doing it even when they didn’t get anything out of it other than the satisfaction that their opponents hadn’t won. What didn’t impress me as much was how disjointed this episode felt, with all the “earlier” and “later” cue cards designed to help – or, more accurately, prevent – the audience from piecing together what was going on. It just seems like there wasn’t time for any of that, and it made enjoying the episode less possible. 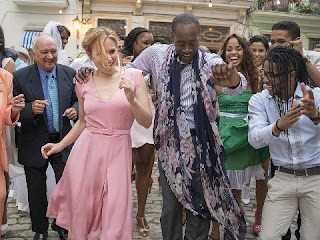 Ending with a dance sequence worthy of “Slumdog Millionaire” which showed the entire cast and crew – the “House of Lies” hat one of them was wearing was a helpful tip – dancing and celebrating the filming of this episode in Cuba was fun, and it shows that ultimately the pod found something in Cuba that they couldn’t find anywhere in America. I’m not sure exactly what that says other than that some things are more important than money. In that sense, this wasn’t a superb finale, a less enthusiastic ending note for an otherwise strong season. Nothing compares to this show’s first season, but it’s been an extravagant foul-mouthed wild ride that I won’t soon forget.